These positions will close when I have received enough applications. Apply soon if you are interested. These positions have now been filled. Many thanks for all the interest. "I have worked with organic and natural products since 1995. At Indigo I offer the very best of those products at an affordable price, and in a pleasant and friendly shopping environment, so that you can share the love I have for these special products." 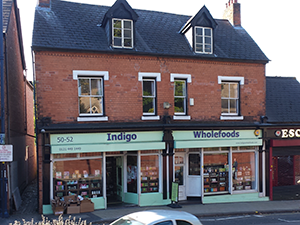 Indigo Wholefoods (Moseley) Limited is a private limited company registered in England and Wales. Company No: 06413811. VAT reg no: 924 5044 39. Directors: G. Howell, J. Howell, H. Lockhart. Indigo Wholefoods (Moseley) Ltd 2008 - 2010. Simple theme. Powered by Blogger.